IT JUST WORKS! 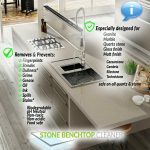 Cleaning Stone benchtops can be confusing on what is best to use to remove the stain and most importantly without damaging the surface. 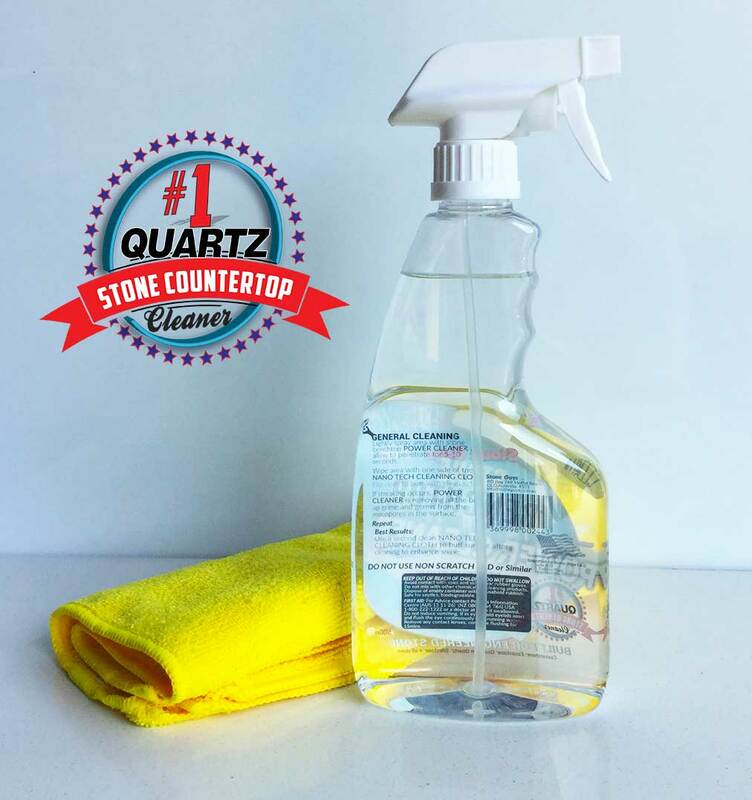 Unlike most common cleaners, Power Cleaner is specifically designed as a non damaging Quartz stone benchtop cleaner. Easy to use, Safe on all stone including Marble – Gloss and Matte surfaces, non-toxic, non-acidic, non-bleach, streak free formula which quickly deep cleans your quartz stone benchtop or any stone for a lasting shine. Main ingredients are not water. Instead the natural active ingredients enable you to quickly remove stains, germs and grime. All Natural – pH Neutral – Biodegradable – Kills 99% germs. No more scrubbing or using dangerous chemicals like creme cleansers. 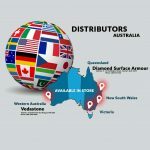 Made in Australia by Stone Industry Professional, not a chemical company. Side by Side it is 100% more effective and cost effective. 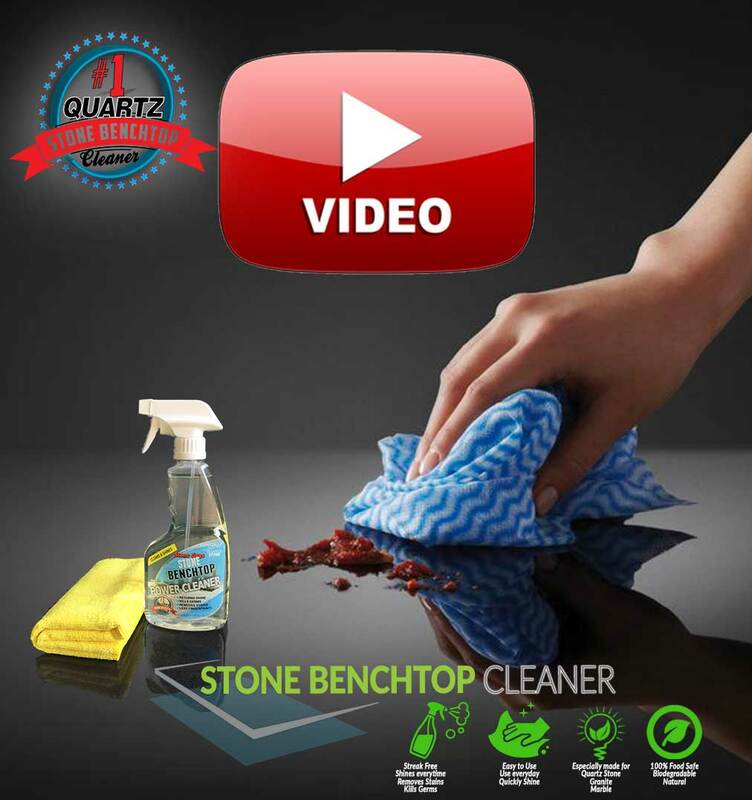 “Best Stone, Granite and Quartz Benchtop Cleaner” – Voted 3 years running Stone Industry Professionals. SUPERIOR RESULTS: Guaranteed to safely clean any Granite, Marble, Quartz Countertop or any hard surface without streaking. Returns the Shine, Polish while cleaning and sanitizing – everytime! REMOVES TOUGH STAINS with ease without the use of harsh chemicals or scrubbers. 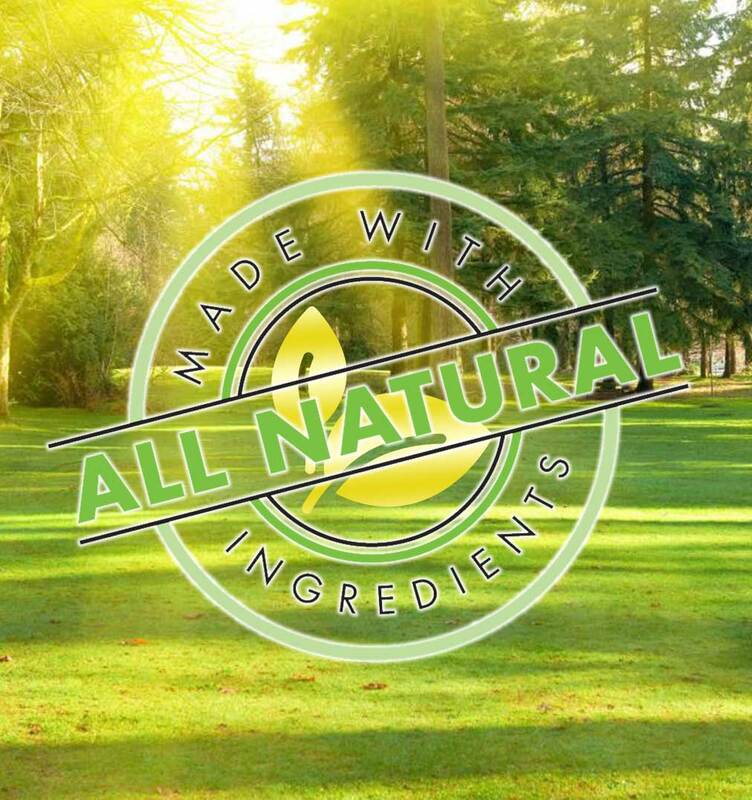 ALL NATURAL INGREDIENTS – 100% Biodegradable, non-toxic, pH neutral & food safe. Will not harm, dull or damage any stone surface. Even safe enough to use on 2pak painted surfaces, your glass or tile back splashes will be streak free clean. 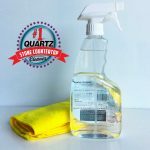 Use Power Cleaner with our nanoTECH cleaning cloth to quickly removes all types of spills and soils, used regularly instead of typical, everyday household cleaning products, which can damage quartz stone and lead to expensive repairs. 500ml of Power Cleaner last even with everyday use, as you only need a light spray. Stone & Caesarstone benchtop cleaner that WORKS! 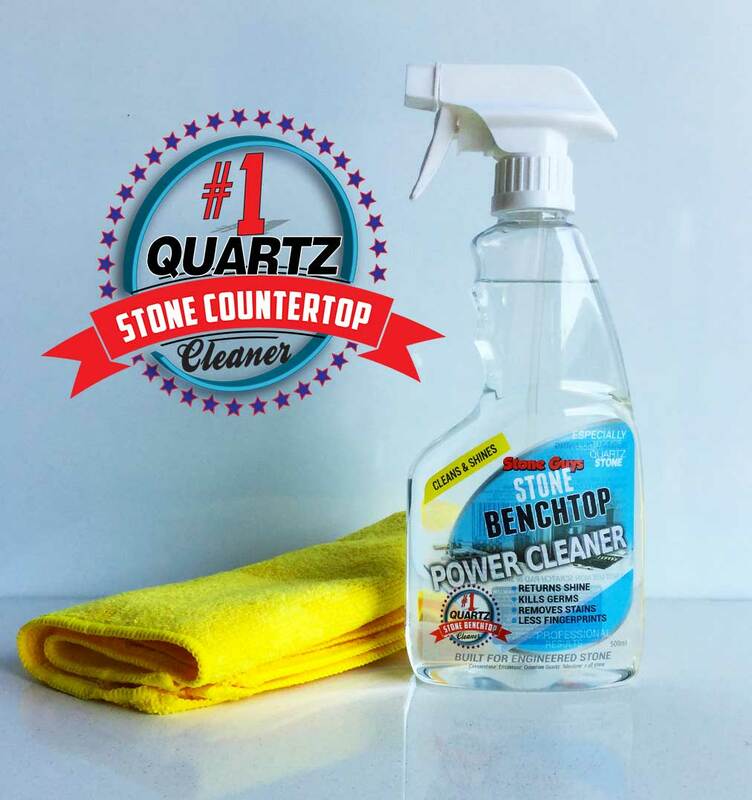 Stone & Quartz Power Cleaner the first choice of Stonemasons, specifically designed for quartz, engineered stone benchtops brands such as Technistone, Silestone, Quantum Quartz, Caesarstone, Cambria to name a few. 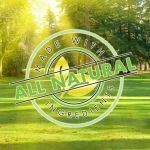 All Natural ingredients, 100% biodegradable, residue free daily cleaner containing a specially formulated for a sanitized & streak-free shine. As a result does not contain any shine damaging acids, bleach, phosphates or ammonia. Consequently it is food safe, non toxic and 100% safe on food prep surfaces. Quickly remove dirt, grime, 99% germs from all stone benchtops without leaving behind soap scum, streaks or a rainbow effect that is common in “All Purpose” cleaners. pH neutral formula is gentle and will not dull the surface With daily use Power Cleaner helps maintain the shine on quartz stone benchtops with a brilliant, streak-free shine. Contact us for more information or email us a photo of a colour to match. 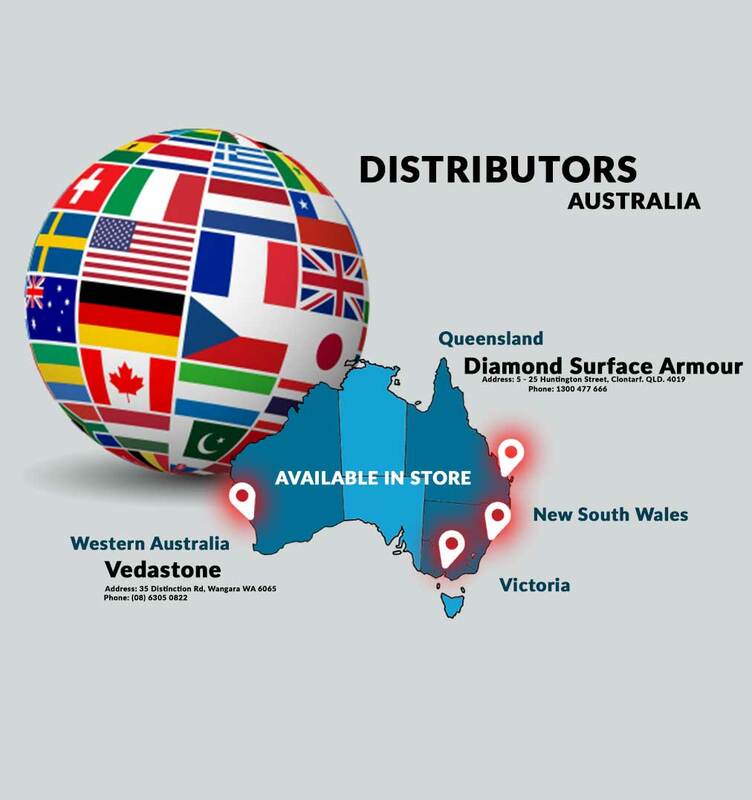 Silestone Cambria Essastone join repair kit Bunnings not available from Bunnings. Stone Benchtop crack repair kit. product packaging may vary from photos. Made by stone professionals for stone. Lighty spray area to be cleaned with Stone Power Cleaner. Allow the sprayed area to stand for 5-10 second to help lift stains, grime & germs. Fold a clean nanoTECH cleaning cloth into quarters. Wipe the area in a figure “8” pattern to remove all the Stone Power Cleaner. Flip the cloth to a clean side and buff off for a streak, germ free shine and polish. Please refer to our Care & Cleaning Essentials for Stone & Quartz. It will help you resolve any issues with any stains (refer to pages 14-17). Allow the sprayed area to stand for 30 seconds to help lift stains, grime & germs. If the stain has been full removed, flip the nanTech cloth and buff to a streak & germ free shine. 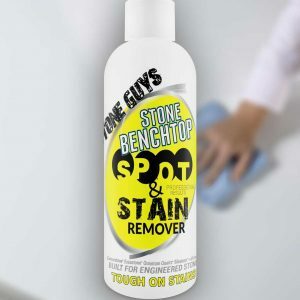 If the stains remains repeat steps 1 to 4 with the addition of two drops of Stone Spot & Stain Remover and allow to stand for 30 seccond to 2 minutes. Refer to our care & cleaning essentials for stone and quartz on page 5 for further details. Matte, suede or honed finishes are no harder to look after than a polished surface with the use of our cleaning products. All of our cleaning products are suitable for all brands and all finishes. Once you have used your nanoTECH cleaning cloth for a time you will need to wash the cloth. Simply put it in with your normal machine wash on any cycle or setting. 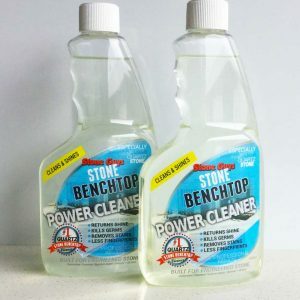 If you have been using other cleaning products, it may take a few application of our Stone Power Cleaner to remove all the contaminants from the surface of your stone benchtops. This is due to fact most off the shelf cleaners contain sodium salt (caustic sodium hydroxide) and/or detergents. Hence these ingredients are caustic (high pH) and contain soaps that leave a film over the stone surface. Sodium salts, because of their caustic nature, are hard to remove once embedded into the stone surface. These types of ingredients common in most off the shelf cleaners will dull the surface or will result in discolouration and yellowing overtime. Brownish stains are generally rust stains from stainless steel utensil holders or sink drainers placed on the stone*. These may get wet and the steel starts to rust because of oxidation from the high pH and caustic nature of most dishwashing liquids. These liquids help penetrate the stain into the surface making it almost impossible to remove with off the shelf cleaning products. Removing these stains is easy with the use our Spot & Stain Remover. Lightly spray the stain with Stone Power Cleaner. Add two drops of Gloss Renew mix with the Stone Power Cleaner. Allow to stand for 2 minutes. Using the nanoTECH applicator in a figure “8” motion. Gently rub the mixture until it has disappeared. If the stain has lightened or mostly be removed repeat steps 1 to 4 until stain is removed. *NOTE: If you have a brownish circle or part of a circle stain that has not been removed by the above steps, it most likely is burn damage not a stain. A specialised professional repair will be needed from one of the only companies that are able to repair such damage – Stone Guys. Fingerprints & Streaks are a major issues on stone surfaces that have not been cleaned correctly. 99% of all granite or marble cleaners have a form of oil contained in the product to enhance the look of granite and hide scratches. These products on any quartz surface causes them to dull, streak and show fingerprints. Stone Power Cleaner will remove all contaminates from the surface including germs leaving a surface that will not fingerprint or streak. Note: You will need to clean the surface daily to remove grime, grease etc. Matte, honed and suede finishes on products like Caesarstone Concrete, Silestone suede ranges and any other brand of quartz or stone requires no more maintenance if Stone Power Cleaner is used on a daily basis to wipe down the stone benchtops. 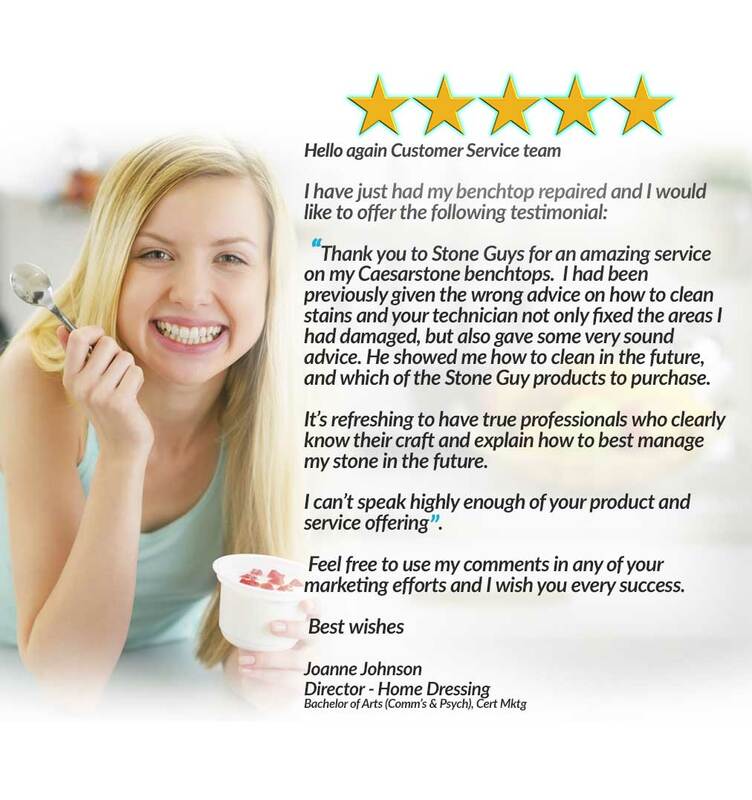 Having trouble with a particular stain or would like the correct advice about caring for/ or cleaning any stone benchtop – email us here. One of our Master Stonemasons will provide further help. 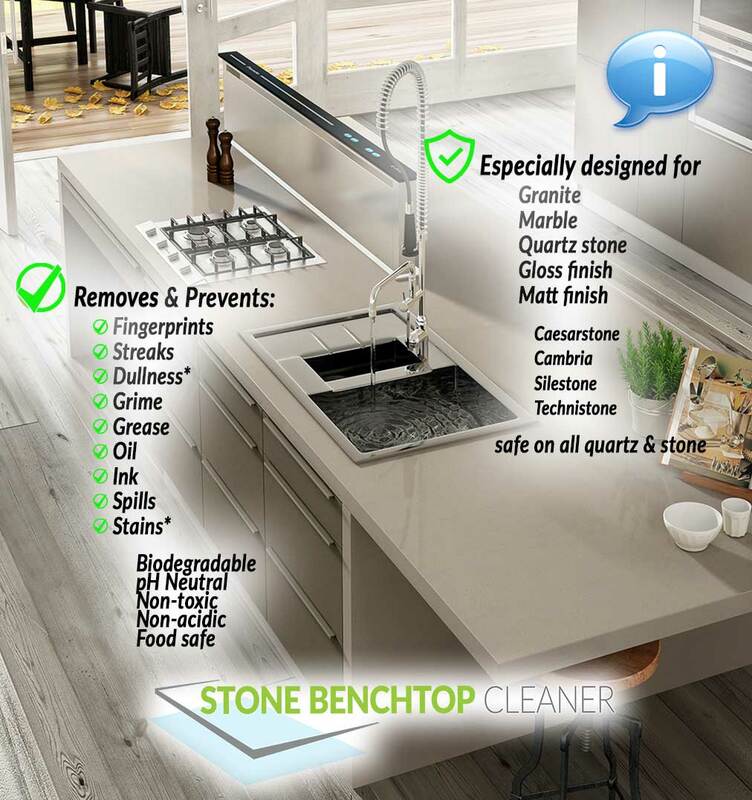 Stone Benchtop Cleaner has produced a comprehensive, easy-to-read guide to maintaining your stone & quartz benchtops including brands like Caesarstone, Silestone, Quantum Quartz, Technistone, Smartstone, Qstone,YDL, Samsung Radianz, LG Viatera, Cambria. MSI, granite, marble and all stone surfaces. 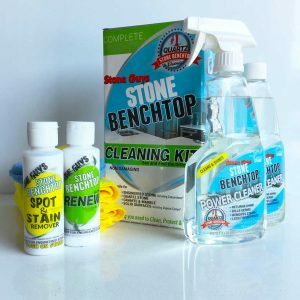 Stone Benchtop Cleaner Care & Cleaning Essentials for Stone & Quartz s divided into clear sections for easy use -daily cleaning, heavy duty cleaning, light regular cleaning, stain removal and tackling special problems such as rust, fingerprints and matte surfaces. Stone Power Cleaner spray cleaner & Refill. 1 x nanoTECH cleaning cloths. 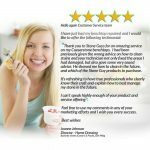 All Natural Stone & Caesarstone Cleaner kit. 100% safe on all stone & quartz. non damaging to any surface. Most simply don’t work and at worst damage the gloss surface. 99% are either highly acidic or worst alkaline with similar strengths to oven & drain cleaner. The few that are suitable, DO NOT remove stains, streaks etc. Dr.Google should not be used. Did you know that Vinegar is the same pH level as hydrochloric acid? 99.9% of all cream cleansers, considered safe for cleaning, will causing dull spots and shadowing on modern quartz benchtops with an average pH level of 11. Window Cleaners are also alkaline and will overtime, like orange based cleaners (acids), dulls the surface making stone stain more easily. Granite & Marble cleaner are not interchangeable nor are they suitable to be used on quartz benchtops. Modern quartz stone benchtops may contain quartz but are held together with polymers, not fused together by heat and pressure from molten lava. Copyright 2014 Stone Guys. ABN:56613390337 Stone Benchtop Repair Specialists Love your Benchtop Again!